Sorry... the 2017 Buick Verano is no longer being sold as new. 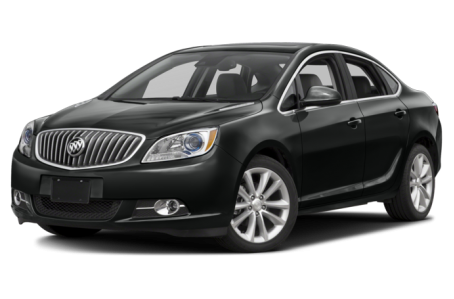 The 2017 Buick Verano is an upscale sedan that offers premium features at an affordable price. It competes with the Lexus IS 200t, Volvo S60, and Audi A3. This year, it remains largely unchanged, but the trim levels have been consolidated. Three trims are available: the base model, Sport Touring, and Leather. It is best to picture the Verano as a classed-up version of the Chevrolet Cruze with more elegant styling and a wider feature set. From the outside, the Verano is easily identified as a Buick with its bold front grille with vertical slats and liberal use of chrome on the body work. Automatic headlights with daytime running lights come standard as well as 18-inch alloy wheels, which fill the fenders nicely. Under the hood, the Verano is powered by a standard 180-hp, 2.4-liter four-cylinder mated to a six-speed automatic transmission and front-wheel drive. Inside, standard features include dual-zone automatic climate control, USB port, auxiliary audio input, power windows/locks, and cruise control. The Verano also comes with standard Wi-Fi hot spot capability, powered by a 4G LTE connection. It is run through GM’s OnStar communications technology and comes with a three month/3GB trial, which can be continued via subscription thereafter. Also available are a 7-inch display in the center console, Bluetooth connectivity, navigation, leather upholstery, heated/powered front seats, and a Bose premium audio system. Standard safety features include eight airbags, antilock brakes, and electronic stability control. A rearview camera is optional, along with additional safety technology such as forward collision alerts, lane departure warnings, rear parking sensors, and blind spot warnings.